Yasodhara Ashram is a yoga study and retreat centre founded in 1963 by Swami Sivananda Radha. 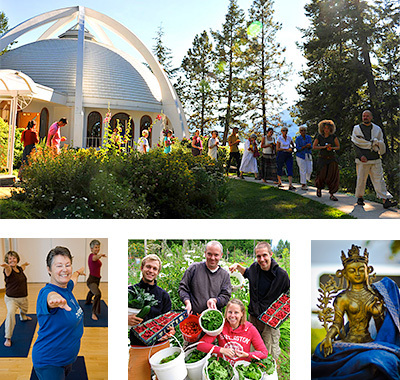 Located in Kootenay Bay, British Columbia, Canada, the Ashram is a vibrant community of Light that offers the teachings of yoga and supports the potential of transformation in each person. Yasodhara Ashram is one of the longest running spiritual centres in North America. For more than 50 years, the Ashram’s purpose has been to stimulate open intellectual and spiritual enquiry. The Ashram offers a wide range of yoga programs year round – from a three-month intensive, to private retreats, teacher certifications and introductions to yoga. The popular Karma Yoga programs are for those interested in learning about the yoga of selfless service, a key spiritual practice. With a lineage of leadership guided by women, the spiritual tradition of Yasodhara Ashram emphasizes the nurturing and devotional qualities of the Divine Feminine. The Ashram is home to the Temple of Divine Light, which recognizes the Light in all religions and the divine spark in each person. The teachings of the Ashram aim to instill quality, care and awareness in all of our actions, and Yasodhara Ashram aims to offer a true spiritual home to all who come.